ISIS has lost almost every stronghold it once held in Iraq and Syria. ISIS once controlled large swaths of Iraqi and Syrian land. Now, it's lost almost every major stronghold. Iraqi forces announced Friday they had taken back control of Rawa, one of the last towns the group controlled in Iraq. It's the latest blow against the terrorist organization that has been rapidly losing ground. The Pentagon says there's still more work to be done. ISIS still controls parts of neighboring Syria. And Defense Secretary Jim Mattis says U.S. troops will be sticking around to prevent an "ISIS 2.0" from rising. But there's some worry that ISIS 2.0 has already arrived. The terror group published a report in its newsletter last month that essentially said it now considers itself an insurgency group. There's also the humanitarian side of things: The International Rescue Committee says there are still almost 3.2 million people displaced from years of war in Iraq. And another 2.6 million have returned home but have no way to rebuild or earn money. 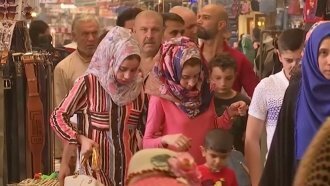 The IRC says the international community shouldn't see the decline of ISIS as the end of its responsibility, and that the people affected by the terrorist organization need continued aid.